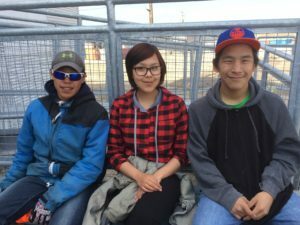 Having arrived in Gjoa Haven the night before, we transferred to shore and were greeted by youth from the community – grade 11 students Barbara and Alvin proved to be warm and knowledgeable guides over the next two days. 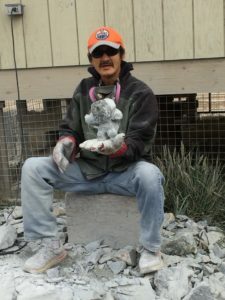 They gave us a guided tour of the town, encouraging us to stop to photograph the muskox hide drying in front of one house, and introducing us to Wayne Puqiqnak, a local sculptor, at another. A small group of us ended up at the local highschool, where both elementary and secondary students had gathered to learn more about the C3 journey. 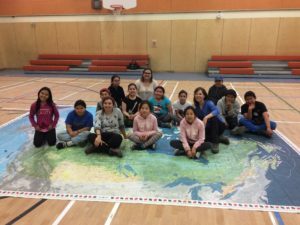 I was fortunate to work with a grade 6 class after this, using the C3 giant floor map of Canada (made in collaboration with the Canadian Geographical Society and the Canadian Museum of Nature) as the basis for our discussion. It was a hoot to crawl from coast to coast to coast as the children found places they had travelled to in the past, or dreamed of going to in the future. The children and their teacher were lovely – curious, kind, and enthusiastic – and a highlight of my trip to Gjoa Haven. After a short visit to Gjoa Haven’s beautiful new hamlet offices, we visited the Heritage Centre, which has a great exhibit on the history of the area, and a wonderful gallery where many in our group bought the work of local artists. We joined the Canadian Rangers for a long hike out to Swan Lake, and were delighted to see our Captain out for a run (he did 17km around the lake and back – what a way to stay in shape at sea!) On the way back to town we visited the monument to Roald Amundsen, the Norwegian explorer who was the first European to make it through the Northwest Passage. Gjoa Haven is named after his ship, which spent two winters in the beautiful harbour in which our ship was now anchored. Moments like this resonated with me as the history of these places came alive, juxtaposed by the contemporary realities of the community. The residents of Gjoa are rightfully proud of their connection to Amundsen’s travels, as their ancestors were the ones to teach him how to survive and travel in the North. There is an important learning that can be connected to reconciliation here – all cultures have expertise and ways of knowing that can help us accomplish our hopes and goals in life, if only we are open to learning from them.